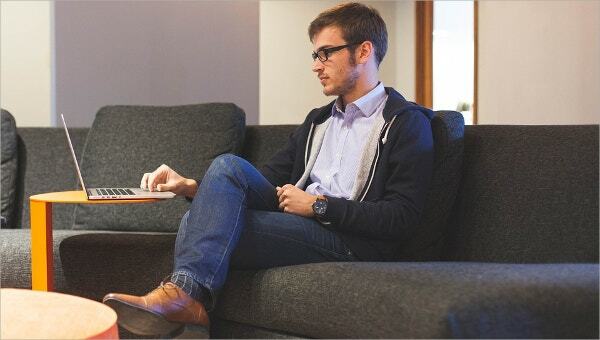 Joomla designers have created several custom templates for professionals who want to build functional and responsive websites for job boards. Job board templates are listing, market, and directory templates that can be used for any website that offers job listings. They can also be customized for niche markets such as babysitters and freelancer listings etc. You can also see Corporate Joomla Templates. Convenience and performance features to look for in a job board template include visual builders, location-aware searches, submission forms, resume creation etc. 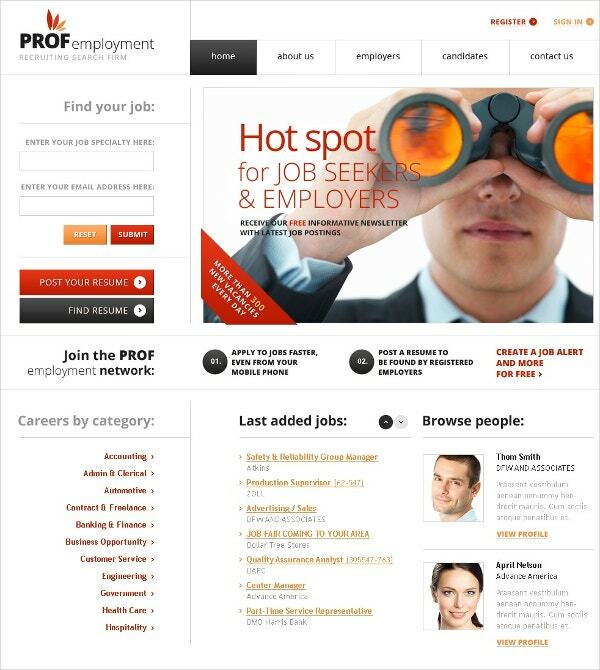 Here is a look at 15 Joomla job board template options. 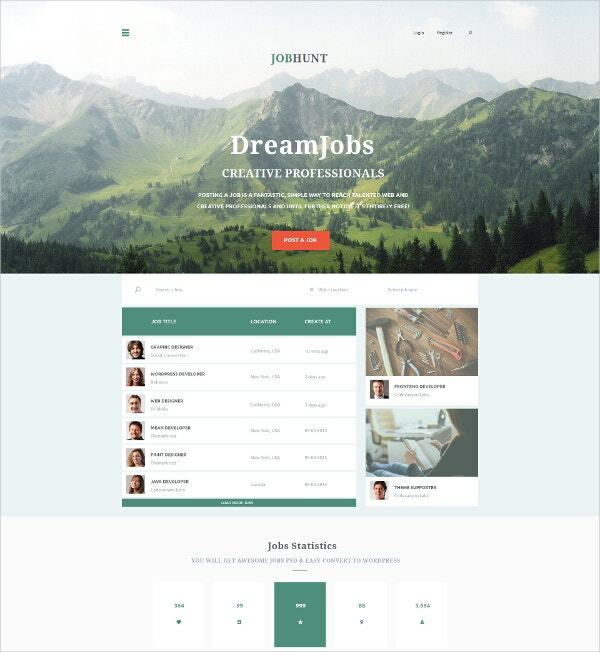 Job Portal is a clean, simple, and affordable job board template with an admin panel, 2-column layout, wide width of 1400 p, blog support, and animation based on HTML plus JS. The template comes with PHP and PSD source files and is native to Joomla 2.5.6. Buyers can also purchase hosting and speed booster features to enhance their experience of the template. You may also see Directory & Listing Joomla Templates. 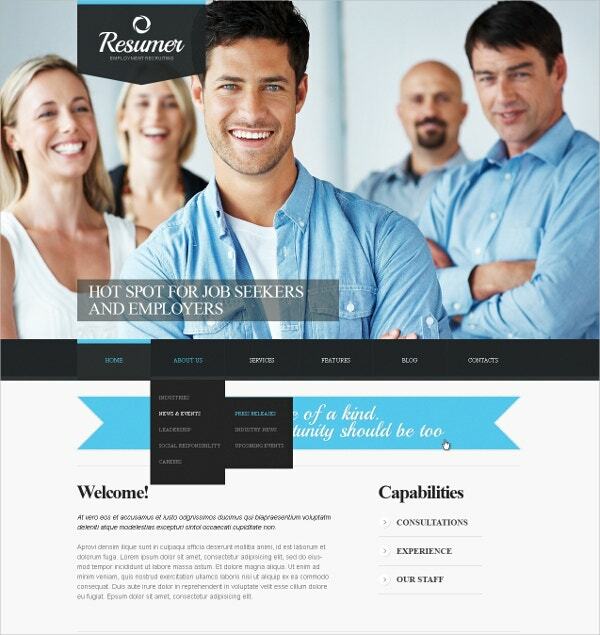 The JobHunt template has an attractive modern and elegant design without clutter. It is ideally built for a job site, with 10 included PSD files, a customizable 1170 p grid, retina-ready design, Google fonts etc. The highly affordable single license is enhanced by the customization support that the developer also offers license holders. You can also see Joomla Themes. 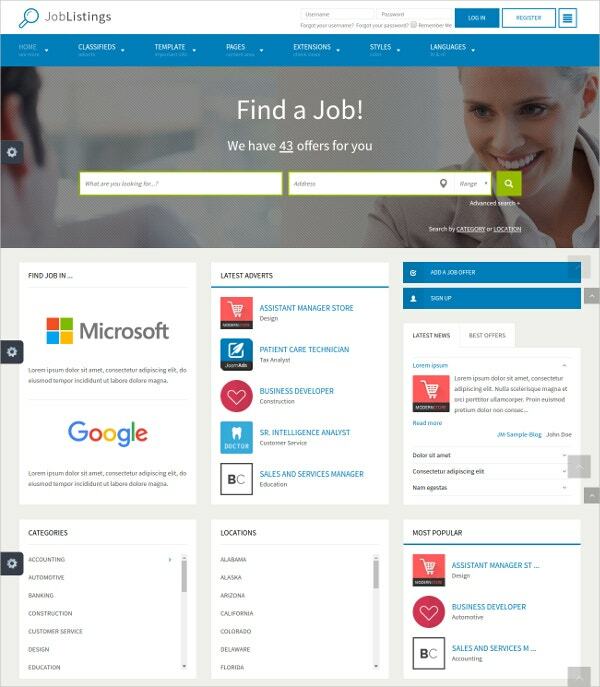 The Employment Business Joomla template is designed for employment businesses who want a modern and light website to help users find suitable jobs. Features include an admin panel, blog support, a wide 1600 p width to customize, and animation with HTML plus JS. The template is native to Joomla 2.5.7. PHP and PSD source files are also available for buyers. 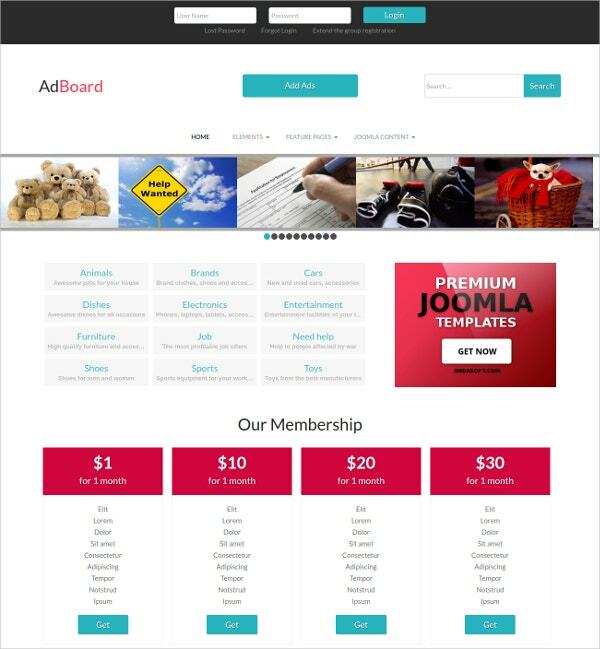 The Ad Board-Classified Joomla Template is a theme with fresh colors and features such as Joomla slideshow for presenting featured jobs on top, Classifieds section maintenance using Advertisement Board extension etc. Simple and paid memberships can be offered with Joomla extension for subscription, which is built with Pricing tables. You can set expiration times, edit and manage users, and enjoy email notifications. 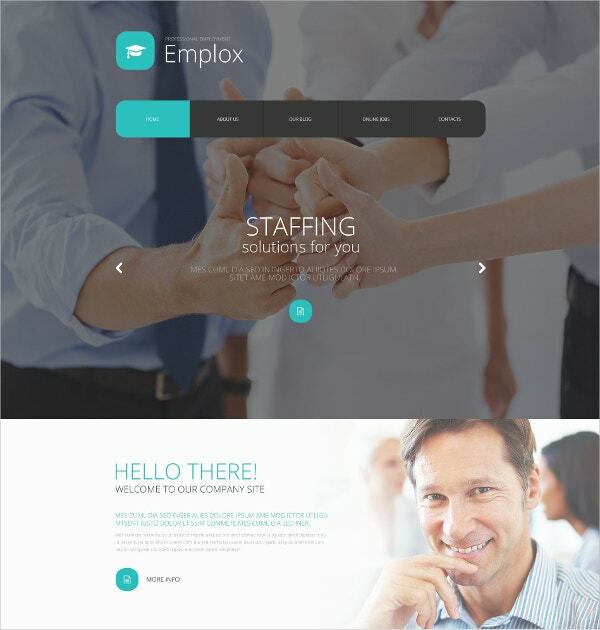 The clean and 100% mobile-friendly Emplox Joomla template can be used for job boards with features like logo placement, menu items, section on company info, animated counters for showcasing hot jobs, color differentiated fonts, buttons and counters that make this theme detailed and well-designed. Light content makes the theme easy on the eye. Newsletter sign-up and social icons are included in the footer area. 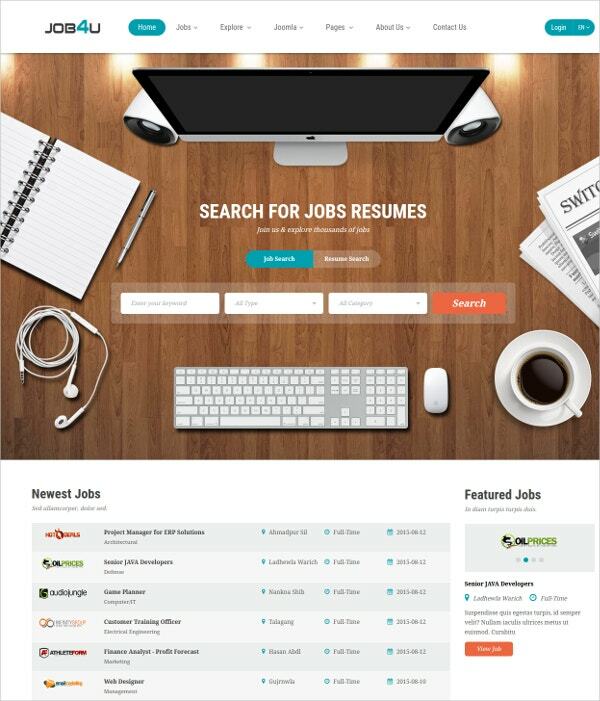 SJ Job4u is a responsive template that uses clean coding and the JS Jobs component to give you an admin panel with which to customize a website for employers to advertise jobs and applicants to upload resumes. Other features include boxed/framed, wide and rounded layout support, RTL and LTR language support, 6 color presents, Cpanel for quick editing at the front-end, typography, shortcode support, LESSCSS support and other powerful features. 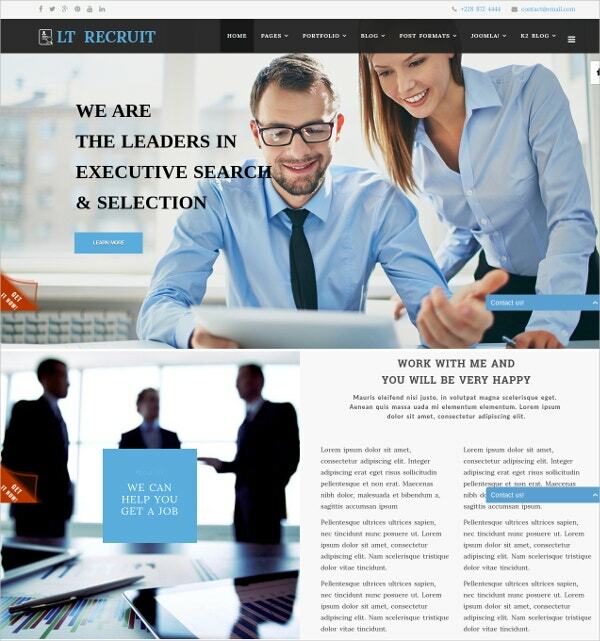 LT Recruit-Job Board is a powerful template with a contrasting minimalistic style for building responsive job boards. It is built on Bootstrap CSS grid, offers supports shortcodes, Font Awesome 4.3 with over 510 icons, Mega Menu, article post formats, optional sticky header, social comments, 4 color styles and more. It comes with a Quickstart package to set up in minutes. The JM Job Listings template uses the DJ-Classifieds extension for the job directory and further stands out by letting you set up promotions, paid categories, limitations etc. Galleries and slides can be built using the MediaTools extension. Other features include DJ-Tabs for accordion tabs, MegaMenu, back-end color modifier, front-end theme customizer, over 31 module positions and more. JoomSky is an attractive and mobile friendly professional theme with a light layout and bright highlights for a user-friendly site. It is also a powerful multi-language ready and SEO ready theme with features including multiple job options, unlimited job posting, built-in search, unlimited user fields, integrated Google Map API for local search, meta keywords, email templates and more. A user-friendly and effective job board will allow job posters to seamlessly register and upload jobs, job seekers to upload resumes, browse jobs by category, and pay for memberships securely. For building a modern job-board on Joomla, look for templates with uncluttered and dynamic layouts. Themes with custom fields and bootstrap shortcode support will give you great flexibility on top of a robust, responsive framework. You can also see Personal Joomla Templates.